With gorgeous DSI-powered sound and a performance-friendly design, the AS-1 is a cult classic in the making. Sounds thick and punchy without the need for any additional processing. Solid sequencing and arpeggiator capabilities. Scale modes and microtonalities are a nice touch. Hands-on control is fairly limited. Pioneer DJ launched its first proper instrument last year in the form the MPC-indebted Toriaz SP-16 sampler. While the SP-16 had a lot going for it, arguably its most eye-catching feature was the inclusion of a filter section provided by Dave Smith Instruments, based on the one found in Smith’s own Prophet-6 synth. Now the brands have joined forces again for a new instrument, the AS-1 monosynth. The AS-1 feels more like a true collaboration than its predecessor; whereas the SP-16 appeared to be a Pioneer DJ product with the added bonus of some DSI tech, this time Dave Smith technology sits at the very core of the sound engine. The AS-1 is effectively a single synth voice lifted from the Prophet-6, complete with the two-stage digital effects section, paired with a sequencer, arpeggiator and single-octave touchstrip keyboard. The analogue sound engine itself is fairly straightforward. There are two VCOs, each with saw, triangle and variable-width pulse modes. The second oscillator has a key follow on/off setting and can also be set to function as an LFO. The two oscillators can be sync’d, and the mixer section also offers an additional sub oscillator and noise source. These are then shaped by a pair of VCFs - a resonant four-pole low-pass filter and resonant two-pole high-pass - both of which feature keyboard and velocity tracking. The analogue part of the signal chain is then rounded off by a VCA section. Modulation-wise, the AS-1 features two ADSR envelopes, hardwired to the amp and filter, although the latter can also be routed elsewhere. There’s a syncable LFO, too, with a random mode and four traditional waveshapes. Deep editing of sounds using the AS-1’s limited range of front panel controls can be a bit of a laborious process. Fortunately, there’s a free standalone software editor available, which significantly speeds up the process and makes patch design a far less fiddly affair. The AS-1 editor is developed by Soundtower based on Pioneer DJ’s specifications. It offers access to every element of the AS-1’s sound engine from a single window. There’s also a sequencer editor, which lets you input and edit sequences on a piano roll-style grid - considerably faster than inputting them step-by-step. A Pro version is also available for $39, adding features including a patch librarian and templates for the arp and sequencer. It could be argued that using software to design sounds and sequences negates the point of a hardware device. This approach feels well suited to the AS-1’s overall ethos though; keeping a separation between its performance-focused interface and the deeper process of designing sounds and editing sequences. It certainly broadens its appeal as both a live and studio tool. Oscillator two can be repurposed as a second modulation oscillator too, and the AS-1 can also receive MIDI aftertouch, which can be set as a further modulation input. The digital effects section, meanwhile, features two stereo effects slots. The first of these offers bucket-brigade delay, distortion and ring mod, while the second has chorus, low- and high-resonance phasers and a Maestro-style phaser. Each effect has two controls, in most cases controlling the depth and rate. The arpeggiator and sequencer are both well equipped. The former has a range of up to three octaves and five pattern modes, including a randomised mode and a user-defined Assignment mode. The sequencer, meanwhile, has a total of up to 64 steps and is programmed step-by-step, by inputting notes, rests and ties via the touchstrip keyboard and front-panel buttons. Note length and velocity can be edited for each step, as well as Slew, which allows adjacent steps to glide into one another. The hardware is compact and fairly lightweight but feels sturdy. It takes its style from both its creators - the sleek chassis and backlit buttons are reminiscent of Pioneer’s DJ line, but the sturdy rotaries and OLED display are pure DSI. The most instantly eye-catching element of the AS-1 is its touchstrip-like keyboard. This offers 13 slightly raised ‘keys’ laid out in the shape of a single chromatic octave, along with a pair of +/- buttons that allow this to be adjusted across a total range of nine octaves. The keyboard can be configured to one of 22 preset scales too, which maps the touchkeys to 13 consecutive notes in the selected scale, removing those from outside the scale. There are also 16 microtonal tunings on offer - ie, set scales that don’t adhere to the standard western 12-note divisions - a nice, creativity-inspiring touch. Despite its keyboard-like look, this touchstrip isn’t really designed for playability. While it’s responsive enough under the fingers, there’s no tactile feedback from the ‘keys’, and it’s too small for anything other than holding down droning bass parts or playing rudimentary riffs. Its real purpose here is as an interface for latching chords for the arp, or step inputting notes into the sequencer - and it functions perfectly well for both duties. Beyond this, the front panel offers a fairly limited selection of parameter controls. There’s a total of eleven rotaries, of which three are dedicated to the filters - controlling LPF cutoff, LPF resonance and HPF cutoff - two are dedicated to envelope control, simultaneously controlling attack and decay/release for both envelopes, and one controls LFO rate and depth. Beyond this, there’s a tempo rotary that doubles as a time division control for the arp, a volume control and a trio of edit and selection rotaries that handle all remaining programming duties between them. The OLED screen provides clear and responsive feedback when making parameter edits, although realistically the AS-1 isn’t a particularly great machine for hands-on sound design. Loading up an initialised patch and creating a sound from scratch is a fairly laborious process, with a lot of menu diving required to edit the various elements of the sound engine using the relatively sparse selection of front panel controls. Fortunately there is a free software editor available, which vastly speeds up the process of designing and editing sounds, albeit without any hands-on interaction with the instrument itself. It would be easy to dwell on this lack of editing capabilities as a major drawback, but to do so would be to miss the point of the AS-1’s appeal. There are plenty of synths designed for quick editing and on-the-fly sound design, but this isn’t one of them. So if patch design isn’t one of the AS-1’s strong suits, what is? Well for one thing, the sound itself. At just shy of £500, the AS-1 is more expensive than some of its most obvious monosynth competitors, but its sonic quality easily justifies the price point. There’s little disputing the Prophet-6’s excellent sound, and although the AS-1 significantly reduces the voice count and feature set of its bigger sibling, there’s no watering down of the sonic quality. A quick scroll through the highly usable preset patches is enough to demonstrate the impressive array of sounds on offer. Despite the relative simplicity of its signal path, the AS-1 is deceptively flexible and capable of everything from powerful basses to cutting resonant leads, slowly modulating drones and punchy synth percussion. The sound is rich and full-bodied, generally punchy enough to sit in a mix with little need for compression and processing. The well-honed effects are great for adding a layer of finish, offering a touch of width, texture and modulation that give the sounds plenty of interest. What the front panel is good at is live tweaking in a performance setting. The filter rotaries make it easy to sweep sounds in and out of the mix, and while envelope controls are limited for detailed patch shaping, they do allow sounds to be quickly lengthened and shortened without destroying their overall shape. The front panel also plays host to a touch slider, which effectively acts as both pitch and mod wheel. Up to seven parameters can be modulated via this strip, including the filters, LFO depth, oscillator pitch and wet/dry mix of each effect. It features a Latch button too, controlling whether the modulation snaps back to its original position or doesn’t. It all adds up to create a workflow that feels tailormade for modern, multi-tasking electronic performers. 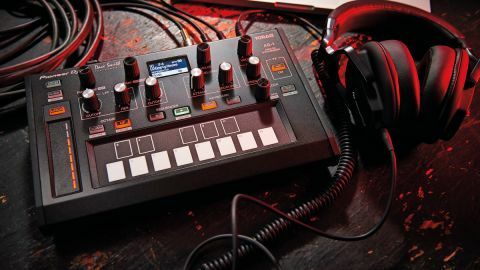 The AS-1 would be in its element paired with a few drum machines, providing driving arps and sequenced basslines behind a single handed techno live set, or adding sync’d melodic accompaniments over the top of a DJ set. From a performance point of view, the only thing missing is some dedicated rotaries for controlling the effects. The ability to adjust the depth via the touch slider is nice - and an on/off button allows them to be quickly punched in and out - but we can’t help but feel we’re missing out on some cool dub-like mangling by not having easy access to the delay time or phaser rate. It is worth noting that every parameter of the AS-1 can be edited via MIDI CC though, so it wouldn’t be hard to add a bit of deeper control via external hardware. There’s also a pedal/trigger input, which can be used to control the sequencer with an audio signal. On the whole though, there’s a lot to like about the AS-1. Its emphasis on a DJ/solo-performer workflow feels unique compared to other analogue synths at this price point. More importantly though, it’s also stuffed full of excellent sounds. Its reliance on a software editor for deeper sound design and its broader ethos of keeping less performance-focussed parameters hidden might be a major turn-off for some potential users, but for those who can see past that, it’ll likely be love at first sight.